The device is supported and maintained in mainline U-Boot. There is no mainstream kernel support at this point. For building mainline U-Boot, use the Yones_Toptech_BD1078 target. For building u-boot, use the Yones_Toptech_BD1078 target. Any button (VOL-, VOL+, BACK) triggers FEL mode from boot1. Sending '2' over UART at boot triggers FEL mode from boot1. Sending '1' over UART at boot triggers an USB storage mode that exposes the nanda partition as well as the Android external storage. The reset button (on the side of the device) reboots the device. The device has an internal µSD card port that shows as mmcblk1. This port doesn't have boot priority over NAND. In order to open the device, there are two Phillips screws to remove from the side with the connectors. The pins from the white part are easy to pop but it is advised to use a a plastic tool, starting from the side with the connectors. The front panel is very fragile and pressuring the screen to pop open the pins can easily end up in breaking the touch screen panel. The UART pads are located on the back of the PCB. 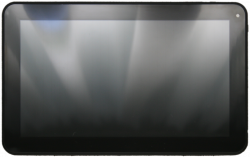 There is a plastic film that protects the back of the board from shorting with the back of the LCD panel. The pads are clearly labeled on the PCB: GND, Rx, Tx. It is advised to put the plastic film back after soldering connectors according to the UART howto. Inet k100c: Same case, different board. This page was last modified on 12 April 2015, at 16:17. This page has been accessed 10,570 times.